Lawyers representing opposition Movement for Democratic Change (MDC) leader Nelson Chamisa arrive at court to challenge President Emmerson Mnangagwa's election victory in Harare, Aug. 22, 2018. Zimbabwe’s highest court is expected to issue a ruling Friday on a petition in which the country’s main opposition group is seeking a nullification of July 30 presidential election won by the incumbent Emmerson Mnangagwa. 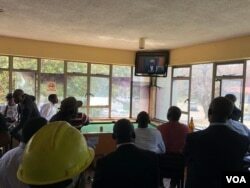 “The judgment is reserved and the court should be able to come with a judgment at 2pm on the 24th of August which is Friday,” said Zimbabwe's chief justice Luke Malaba, after hearing submissions for nearly 10 hours from lawyers of the country’s main opposition leader Nelson Chamisa, Mnangagwa and the Zimbabwe Electoral Commission. 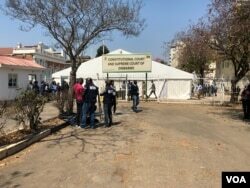 The Movement for Democratic Change (MDC) accused Zimbabwe's election commission of rigging the vote in favor of President Mnangagwa and his ruling ZANU-PF party. According to the official results, Mnangagwa won nearly 51 percent of the vote to defeat MDC leader Nelson Chamisa, who received just over 44 percent. The MDC says the commission inflated President Mnangagwa's vote totals, and says that more ballots were tallied at some polling stations than there were registered voters. 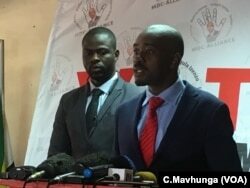 Chamisa told reporters on Monday that the MDC has a solid case that election results were fraudulent, and was confident the court would order a new election. Nelson Chamisa, Zimbabwe’s opposition leader, talks to reporters in Harare, Aug. 20, 2018. When Chamisa's supporters took to the streets the day after the election commission declared Mnangagwa the winner to protest the results, police responded by using tear gas and live fire, killing six people. The July 30 presidential poll was the first ever in which President Robert Mugabe's name was not on the ballot. The 94-year-old Mugabe was forced from office by a military takeover last year after nearly 40 years in power, surrendering the presidency to Mnangagwa, his vice president. The opposition's challenge forced Mnangagwa's planned inauguration on August 12 to be postponed. If the court upholds the incumbent president's win, his inauguration would take place within 48 hours. Columbus Mavhunga contributed to this report from Harare.